At the beginning of his turn, Liu Feng can select up to two other players. He takes a card from each and puts them on his character card. These are Betrayals. Other characters can discard two Betrayals to attack Liu Feng. Liu Feng uses "Defecting Heir" before his judgement phase. Liu Feng cannot use or discard his own Betrayals. Other characters can discard two Betrayals to attack Liu Feng under applicable conditions only. The other character must have Liu Feng in their attacking range and must not be violating the 'one-attack-per-turn' rule. Players cannot use Betrayals for Duels or Barbarians played by Liu Feng. When they are prompted to attack Liu Feng via a Coerce, they may use Betrayals however. The Attack produced by using Betrayals is colorless and has no elemental properties regardless of the color of the Betrayals discarded to produce it. Weapon and character abilities can be used in conjunction with the Attack generated from the Betrayals. Liu Feng is similar to Zhang Liao and Zhang He, but must be used carefully. If the player using him only takes hand cards, Liu Feng will simply be a weaker version of Zhang Liao, as the numerical card advantages of "Raid" and "Fallen Heir" are both two, but "Fallen Heir" allows enemies to attack Liu Feng more frequently. 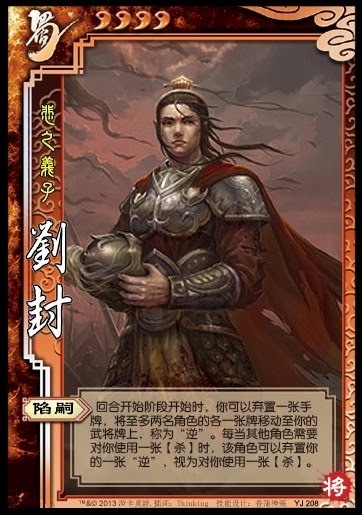 When using Liu Feng, be sure target equipped cards with "Fallen Heir" as frequently as possible, especially weapons and -1 Horses. If enemies cannot reach Liu Feng, they cannot use his Betrayals to attack him. Also, equip the Wood Armor whenever you get the chance. With the Wood Armor equipped, Liu Feng's allies 'burn through' his Betrayals using them to attack him. All in all, Liu Feng seems like a great character.